Combining antioxidant-rich pomegranates with the catechins in black tea gives your body extra free-radical-fighting power to combat aging. If pomegranates are too tart for your taste, you can sweeten this tea with honey or use presweetened pomegranate juice. For a stronger drink, stir a teaspoon of instant iced tea into the pomegranate juice. 1. In a pitcher, steep the tea bags in hot water for 3 minutes. Remove bags. 2. Add the pomegranate juice and stir well. If using honey, stir in now. 3. 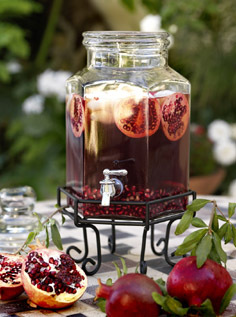 To serve, pour into tall glasses over ice and garnish with fresh pomegranate seeds and slices.